Throughout the past couple of centuries there have been a number of companies that have been built on basic psychological principles. IKEA is one such example of this. Eponymously dubbed "The IKEA Effect,' the principle that the company relies on is the cognitive bias consumers exhibit towards products that they contributed to in some way. In simpler words, people tend to disproportionately value something if they perceive that they were involved in its creation. It is important to note that IKEA did not discover this effect - product designers were privy to the impact that personal involvement had in consumers perception of product value long before IKEA cashed in on it. The phenomenon was first observed in 1950 when instant cake mix was initially developed. Michael Norton of HBS (who coined the phrase "IKEA Effect") explains that when instant mixes were first marketed in the 1950's, consumers were resistant because making the cake felt "too easy." Because homemakers did not feel invested in the process, they placed no value on the outcome. If we fast forward to the present date we know that instant cake has not only caught on but is the dominant form of cake today - so what changed? The answer that producers came up with is almost as simple as it is ingenious: they made you add an egg. Just adding that one simple step was enough to feel like they were baking, and almost overnight instant cake mix sales began to take off. Augur is building a network of decentralized prediction markets based on a similar, simple psychological concept referred to as 'the wisdom of the crowds.' TWOC is generally traced back to an observation first made by Charles Darwin's cousin, Francis Galton, in 1907. At a county fair, Galton observed that the average of all entries in a 'guess the weight of the ox' competition at a county fair was amazingly accurate - beating not only almost all individual guesses, but those of supposed 'cattle experts' as well. This is the essence of TWOC effect, that the average judgement of a crowd of independent observers (for whatever reason) overwhelmingly tends to converge on the right solution. It should be noted here that one important tenant of this effect that must be in place is decentralization - that is, participants must form their opinions independently. TWOC has been shown by psychologists to be disrupted by what is known as "the undermining effect of social influence." An easier way of saying this is that if you and your friend are both in Galton's 'guess the weight of that ox competition' and you see his or her answer, you might be swayed by their opinion even though they likely have no idea what the correct answer is either. Predict the Outcome of Real World Events: You make your predictions by trading virtual shares in the outcome of events happening in the real-world. If you think Hilary Clinton will be elected President, the Yankees will win the World Series, or Leonardo DiCaprio will win another Oscar, then you'll buy shares in those outcomes. If you buy shares in the correct outcomes, you'll win real profits. Earn Real Money Trading Profits: The prices of the shares you trade in add up to one dollar - so if you buy a share at even odds it will cost you 50 cents. If you end up being right, you'll get back one dollar for every share you bought. If you're wrong, then you've lost the money used to buy your shares. As with any market, the price of shares fluctuate over time. As more people buy shares in an outcome, the price of that outcome will rise while the price of the other outcomes will fall. This gives you further opportunities for profit - by buying low and selling high, before the final result of the market is known. While Augur may have merit as a forecasting tool, companies have proved fairly conclusively for over two hundred years that accurate forecasting just isn't in the cards. Just ask anyone you know that works involved in SIOP, Demand Planning, Inventory Management or just about any other Supply Chain function - while Sales might say they know how many units they are selling this quarter, the number companies set is often more of a goal than a prediction. Those involved in the purchasing of raw materials will tell you the same thing. While organizations like CRU put out prices on (semi) commodities such as steel, no one truly knows what's going to happen. I've often heard it said that "if we knew what was going to happen in the market we'd all be making millions as traders". Those readers who are familiar with the concept of hedging and remember the title of my article may begin putting together what I am alluding to here. For those of you who aren't, my opinion is as follows: Augur's greatest value-add is the ability it offers individuals who have no access to global financial markets to mitigate the risk of adverse events. 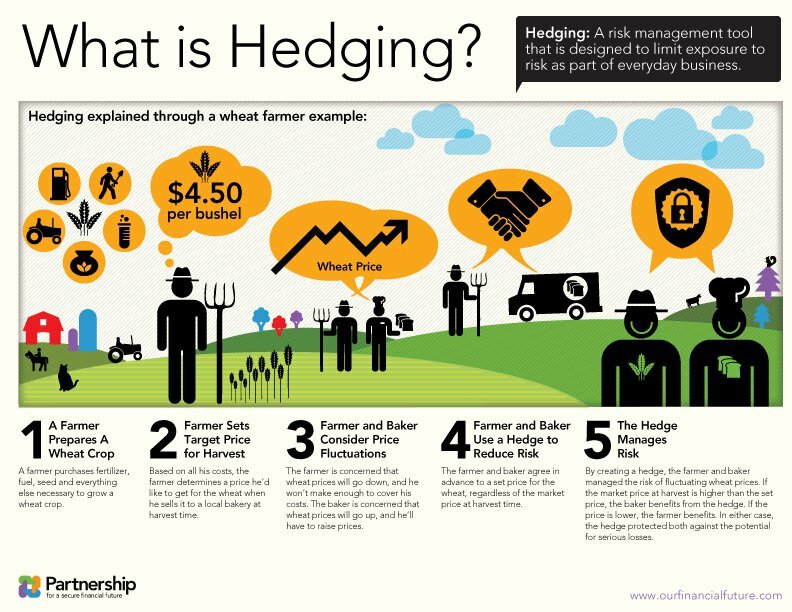 So what exactly is hedging? Broadly speaking, a hedge is a means of mitigating risk. There are several types of hedging organizations (and soon individuals) can do - physical, supplier related, financial, and others. For the purposes of this article, let's focus on the financial method of hedging, which will require us to adjust our definition a little. Now let's use the definition that a hedge is an investment intended to reduce the risk of adverse price movements in an underlying asset. The most common ways that companies hedge is through the futures market, which consist of securities whose prices are correlated in some way to the asset that they cover. Let's break it down with a simple analogy. In the above example, a farmer and a baker are concerned about what the price fluctuations of wheat could mean for their annual profits. The farmer is concerned that if wheat prices go down, his revenues won't cover his input costs (fertilizer, seed, etc...) with any profit left over. The baker is concerned that if wheat prices go up, he will be forced to pass that cost along to his customers and thus lose business. Together, they come up with a solution to put both of their minds at ease: they agree to exchange for a specific price of wheat on a certain date, irrespective of the market price that day. By entering into this agreement (known in the financial world as a futures contract) they have both successfully managed the risk of fluctuating wheat prices. At the cost of the futures contract, one party has successfully set a floor for his revenue and the other a ceiling for his costs. If wheat prices go above the agreed upon price, the baker will benefit because he will be able to buy wheat below the current market price. If wheat prices go down, the farmer will benefit because he can sell at the previously agreed upon price and not worry about his margins compressing unduly. So what does this have to do with Augur? While financial hedging is an instrument that is available to many companies today, there are a huge number of events that can not be hedged against by someone that does not have access to financial markets. Consider again the example of the farmer, perhaps one in a developing country that lacks access to global financial markets (note: this examples is outlined by Don Tapscott in his book "Blockchain Revolution"). Although CME currently sells weathers futures contracts, a farmer without the requisite capital to open a trading account would be unable to mitigate the risk of bad weather. But what if Augur created a prediction market for the weather, where he could place a bet on if the temperature remained above a certain temperature for a predetermined number of days during the harvest season? Augur participants could buy shares corresponding to preferred weather patterns (i.e a certain number of days at a certain temperature during the agreed upon period) or adverse patterns if they think the temperature will fall below the agreed upon temperature. The farmer would have the option of taking an offsetting position - in this case, he would take the position that the weather will NOT cooperate. Now, if the weather remains above a certain temperature and produces a good crop, the farmer will have successfully profited and mitigated his risk. If, however, the weather falls below the agreed upon temperature during that time period, the options that he bought through Augur would pay out, and he will at least receive some monetary compensation that way. No one can predict the future. AI has offered promising advancements in recent years, with tech giants Google and Baidu spending a combined $20 - $30 BUSD on the technology in 2016. However, no matter how fancy our models get they are all constrained by the same limitation: they are built on events that have happened in the past. 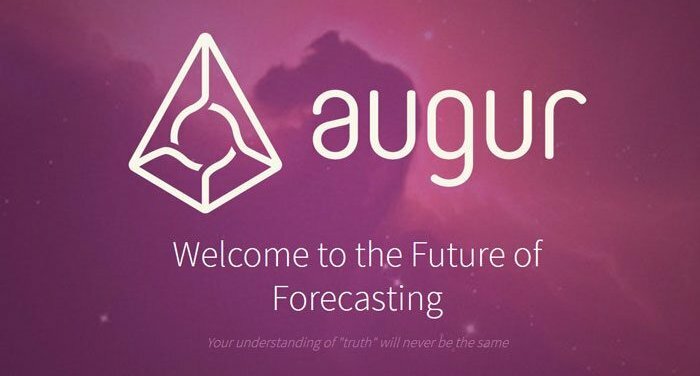 While Augur offers an interesting foray into the world of predictive forecasting and may improve its efficacy through a large scale crowdsourcing platform, its real value in what it offers in risk mitigation. In addition to possibly functioning as an accurate forecasting model by cashing in on 'wisdom of the crowds' psychology, Augur affords a greater degree of security to those who have no access to the financial markets by allowing them to hedge against the occurrence of adverse events.